Is there anything worse for a crafter than running out of their favourite supplies? It can happen if you don’t keep track of what fabric you used: brand, where you bought it and why not how much it costs. 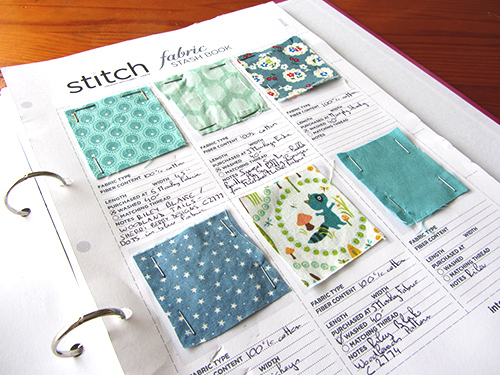 That’s why I was happy to come across the Stitch Stash Book you can download for free (though it requires you create an account with them). I order mine by fiber and colour. Above is a page for blue cotton. Information I find important to record are: fiber content, place of purchase, washing temperature. I barely use the “matching thread” entry but use the notes to give as much detail as possible on the design and colourway. Now I won’t lie: it is far from up to date but I think as I reorganise my stash I’ll get to stick a sample of each one in my swatch binder. Anyone has any tips for organising their fabric swatch? Great idea but I wish there was a way to change the topics (fabric type/fiber content etc.) as I’d like to have Manufacturer, designer, line, date. I only buy 100% cotton (or wool or silk so I don’t have to write those down unless I added a note on silk45/cotton55 for radiance), I don’t prewash, and matching thread is a total waste for me!